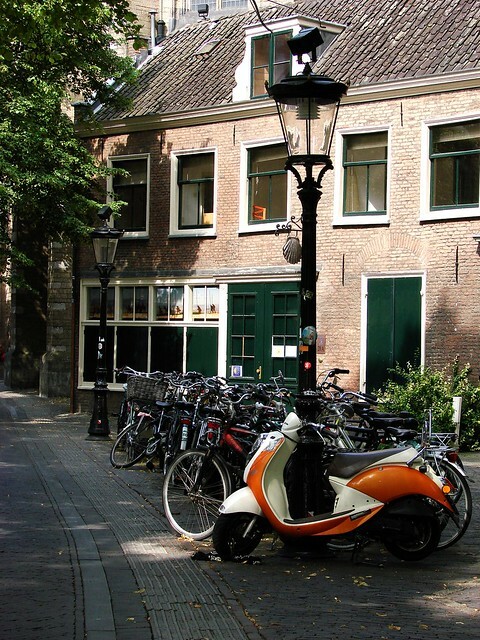 My map of 18 things to do in Utrecht has been getting a lot of hits recently, probably due to the fact that people who are coming for the Tour de France Grand Depart in just a few days are looking for, well, things to do in Utrecht. So while I have a few minutes free, I thought I’d share a few more things to check out while you’re in town, whether for the Tour de France, or just in general. 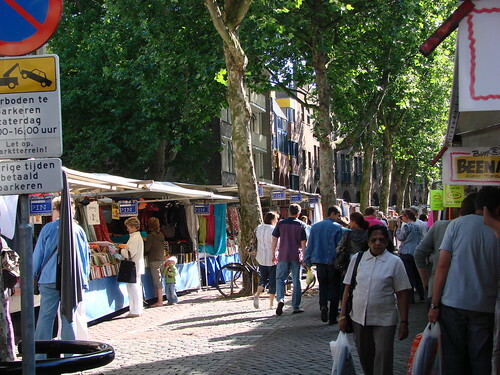 The Tour de France route goes along the Maliesingel, but it generally misses the Maliebaan itself. Somewhat ironic, as that was the site of the very first bicycle path in the Netherlands. Today, it’s a beautiful, peaceful, tree-lined street with a mix of roads and paths, as well as sculptures along one section. If you just want to get away from a bit of the hustle and bustle (or want to move between two sections of the route), it’s simply a nice walk to take. If you look at a map of the city center, you’ll start to realize that there’s a canal that runs almost completely around the binnenstad (old city center). At one point, the canal did circle the city, and in a year or so, it will do so again. 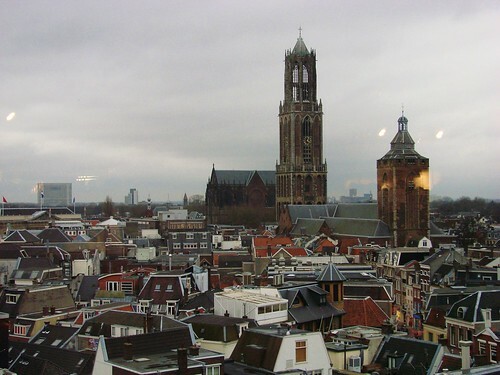 In the area around the Vredenburg/Hoog Catharijne/Centraal Station, you’ll see a lot of construction. They’re building bridges and re-installing the old canal, which had been turned into a roadway. 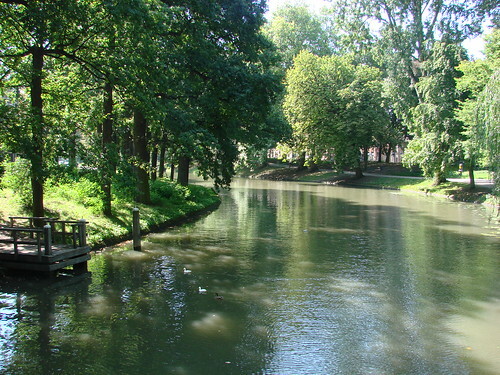 Fortunately, most of the canal that rings the city is still in place and it makes for a nice walk around the city. 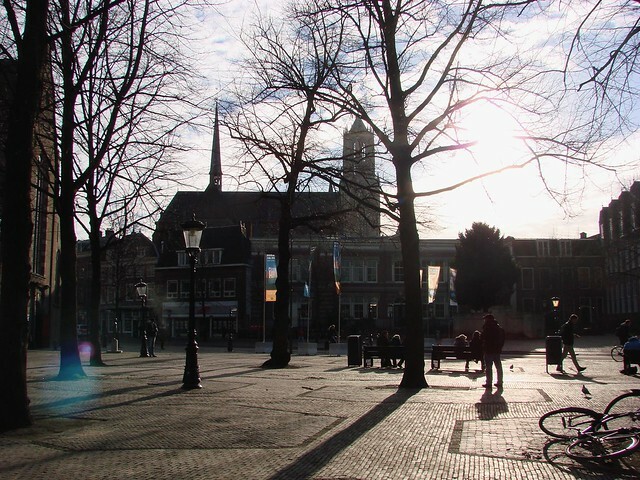 You’ve always got the scenery of the canal, but you’ll also come across some other interesting sights, including the Wolvenplein, which was a working jail up until the past year or so. 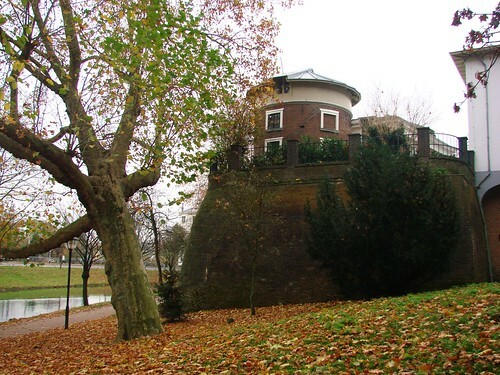 At the other end, you’ll find the Sonnenborgh Museum with its remains of the city’s walls(second photo). 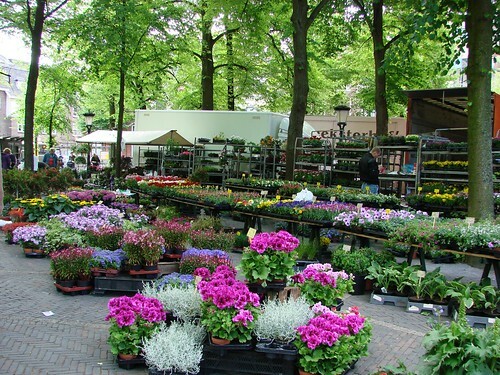 There’s no shortage of flowers for sale in Utrecht throughout the week, but on Saturday, the big flower market can be found at Janskerkhof. 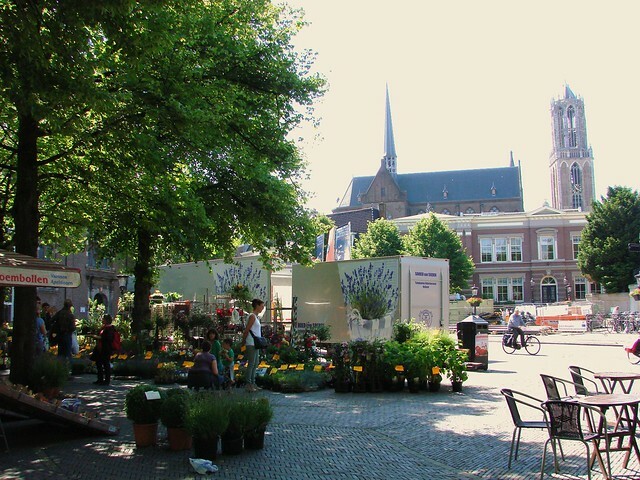 Under the tree-covered square surrounding the picturesque church, you’ll find a huge assortment of seeds, plants, trees and more for sale, as well as beautiful bouquets, all at incredibly good prices. Even if you don’t purchase anything, it’s a lovely spot to meander. Come on. 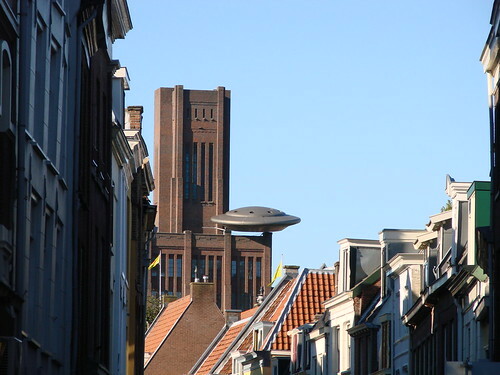 Like I’m going to do a list of things to see in Utrecht and not include this. Sure, it’s hard to miss, but it’s still pretty damn impressive. Even if you don’t want to take a guided tour up the 400+ steps, you can still enjoy a lot of it from ground level. On Saturdays, you can also typically enjoy one of the carillon concerts that ring out over the city. There will be some bicycle-themed songs for the Tour de France, of course. 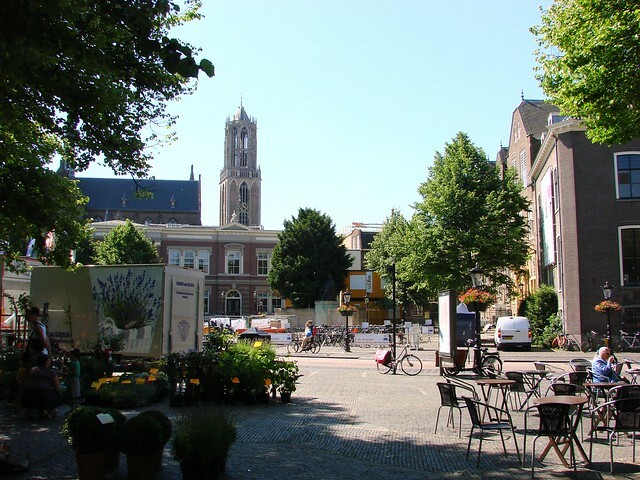 And while you’re in the area, check out the cathedral and the cloistered garden there in the Domplein, and Flora’s Hof, another garden with an adorable marmalade cat usually on the prowl. 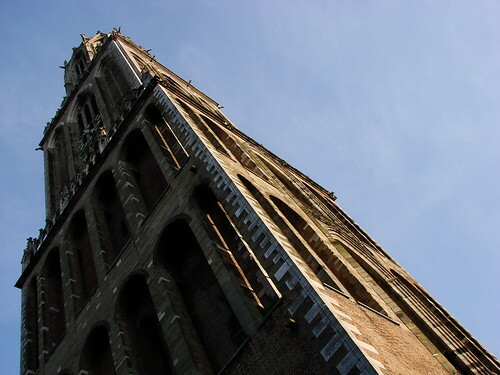 Every Saturday at noon, under the Domtoren, you can take an amazing free guided tour of the city. 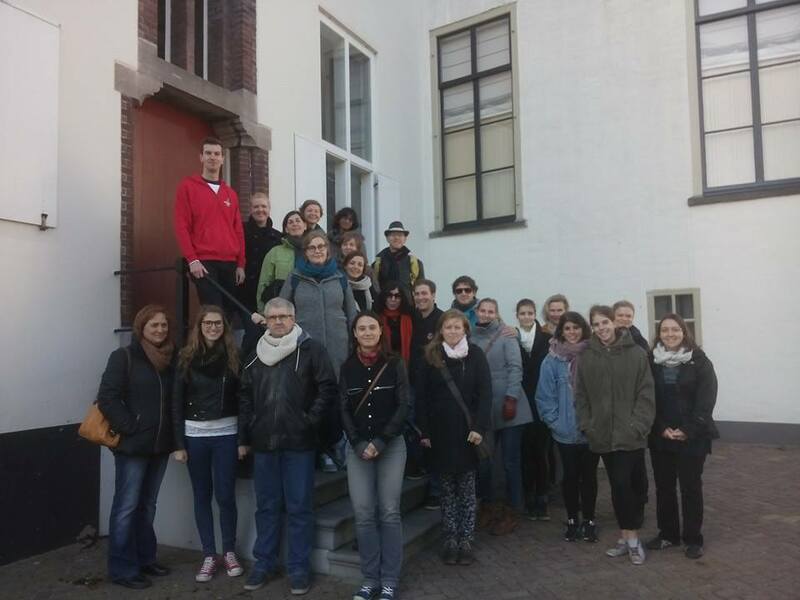 Completely led by volunteers, they take you on a three-hour walk around the city, giving you some great insight into the history and culture that makes Utrecht so wonderful. It’s a fantastic way to also get an idea of things you might want to explore further during your visit. It’s also great for anyone new to the city, and even those of us who have been here for a while. Just show up at noon and you’re good to go! 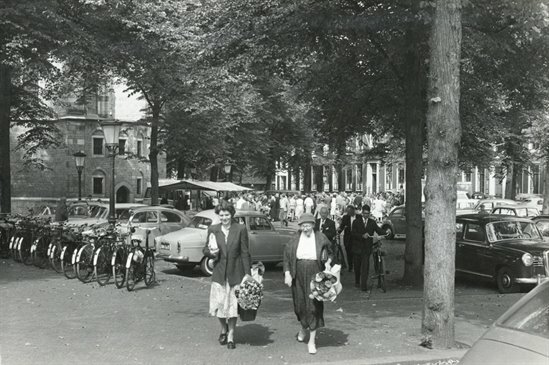 This photo from 1959 shows the Janskerkhof during one of the weekly Saturday flower markets. That aspect hasn’t changed at all and it’s a stunningly beautiful spot to hold a flower market. In the shadow of the church and the trees throughout the square, the flowers in the market are just gilding on this historic space. I love the hustle and bustle and bursts of color that fill the space on Saturdays, but I also love the serenity of the area on a quiet Sunday morning, when the only remains of the market are a few fallen flower petals and a new bouquet at the feet of the Anne Frank statue in front of the church. My present-day photos were taken on one of these quiet Sunday mornings. To be honest, I was interested in the row of bikes and the scooter that day. I only saw the old photo of the spot recently and knew I already had a comparison photo. The area today looks much as it does in that photo from 1959, though they’ve gotten rid of most car parking in the square in recent years, though you will see the odd scooter. 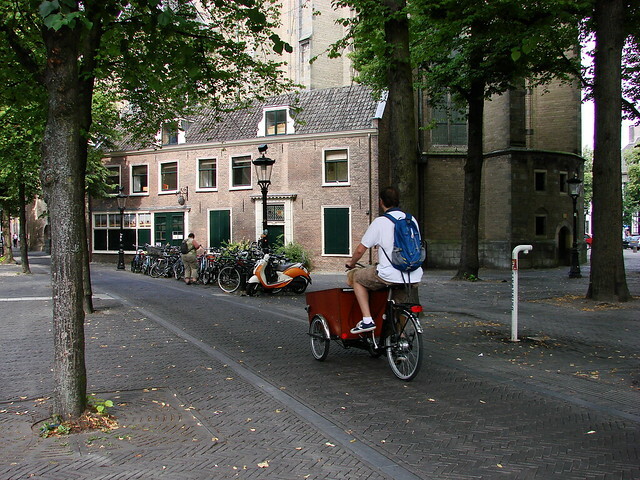 Even the lamp and bicycles look much the same, though the bikes now face the other direction to allow for a separated bicycle lane. Today, you’re just as likely to see people walking away with the same bouquets of flowers as cycling away, with flowers in hand, under the arm, or in bags or baskets. I can’t tell you how many times I’ve seen someone leaving the market with a small potted tree strapped upright onto the back of their bicycle. 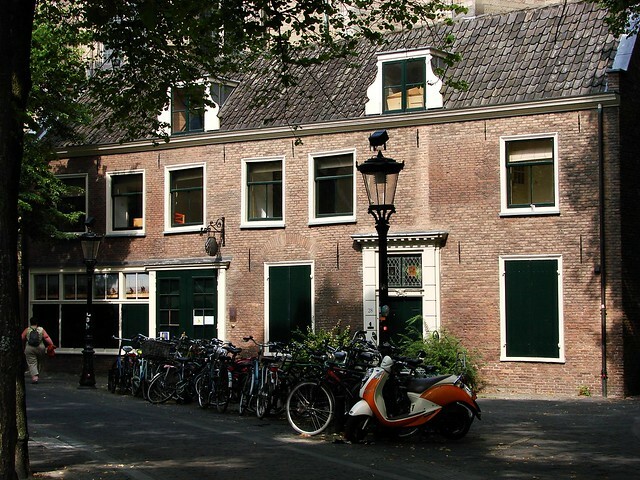 As you wander through the Utrecht binnenstad, if you look closely, you’ll probably notice a number of painted-tile images throughout the city. All are hanging on walls in public places, although some are easier to spot than others. It is worth keeping an eye out for them, as they are something like the city’s own version of my Time Travel posts. Each tile image is taken from old paintings of the city, depicting various important/well-known spots around town. Sometimes, there’s little change; other times, it is completely different. Either way, it’s fun to stand in the spot and compare then and now. The tile images are an ongoing project, from what I can tell. 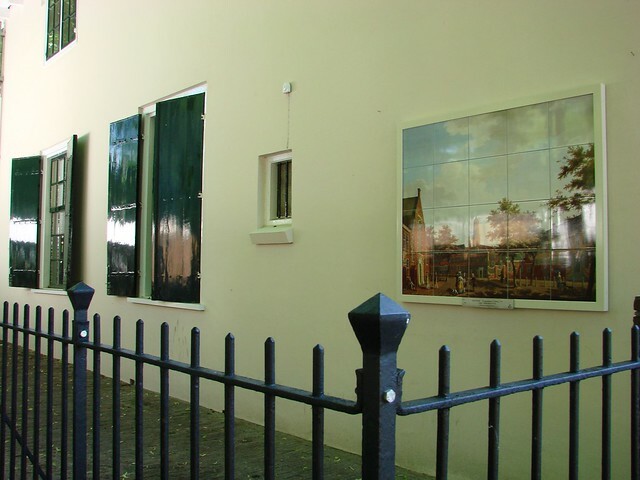 One of the latest ones to go up is a depiction of Janskerkhof, as painted by Isaac Ouwater in 1779. 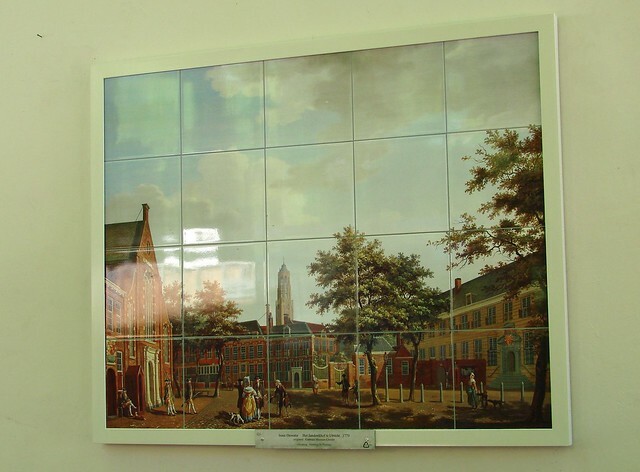 The original painting belongs to the Centraal Museum, but if you go around the back (northern side) of Janskerk, you’ll find the tile version on display. 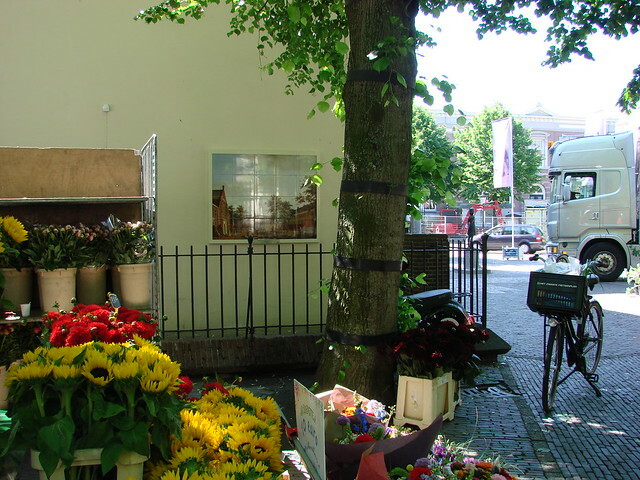 On Saturdays, it can get lost amid the bloemenmarkt, but all of the flowers for sale also add to the charm of the setting and the flower market wouldn’t seem out of place in the painting. The painting shows a handful of people going about their daily lives and it really doesn’t look much different today. A few things have changed since the painting, including the addition of the Willibrordkerk (the spire in the background of my photos) and many more trees. As a result, it’s hard to get a clear, full shot of the area, but behind the trees and the flower trucks, it really does look quite similar. 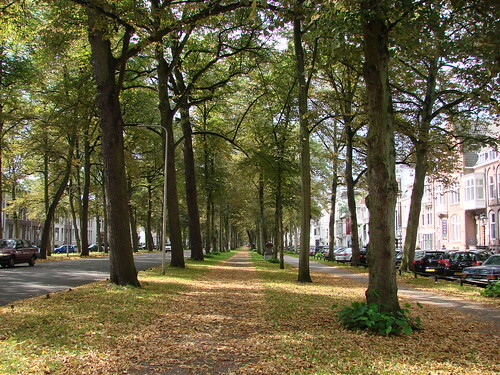 Trust me when I say that the Janskerk is there on the left behind the trees, looking much the same as it does in the painting. Here’s a winter view of the square from much the same spot. 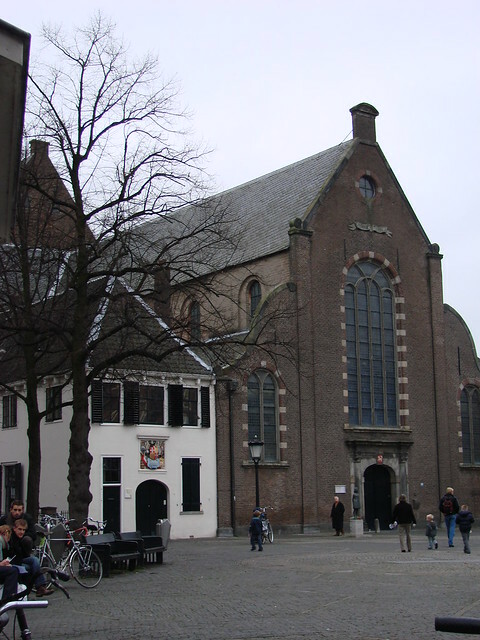 Here’s a view of the Janskerk itself: And here is the building on the right of the painting. 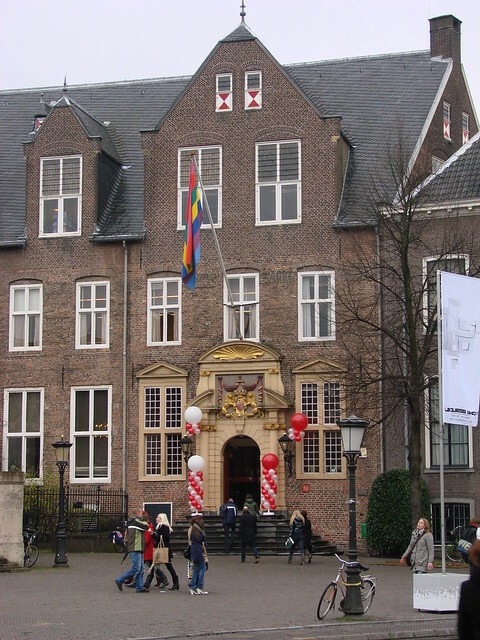 The building itself has changed, but the grand entrance is still recognizable.